A UFO flying over San Juan? Luis Adolfo Tinto and Juan José Mulet, public utility inspectors, submitted the images of what they took to be a UFO to Tiempo de San Juan. 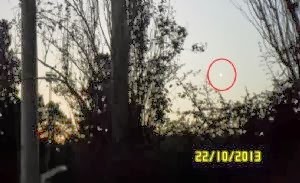 They saw the object on Tuesday, October 22 while going about their duties. “To us it wasn’t a meteorite. A meteorite falls. This one stopped or changed position until it vanished due to the curvature of the earth itself," they added.